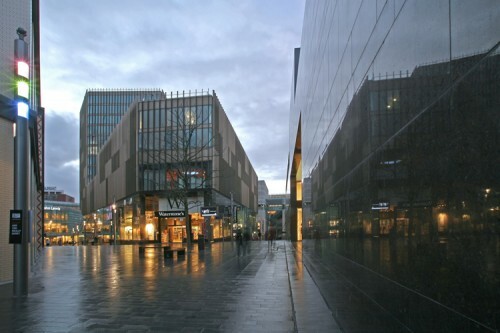 When Balfour Beatty were awarded the Paradise Street development they came to Q Flooring Systems Ltd with a basket of natural stone packages that ranged from external cladding to floor finishes for the shopping arcade, external pedestrian thoroughfares and roof garden terrace. Sourcing the coffee brown granite cladding involved a visit to both the quarry and cutting shop in India to ensure that the exacting specification was achieved. The vast expanse of external cladding meant that uniformity in both colour and size were essential to the success of the project. Fixing the 40 mm slabs was based on the use of Halfen mechanical body anchors and cast-in channels. 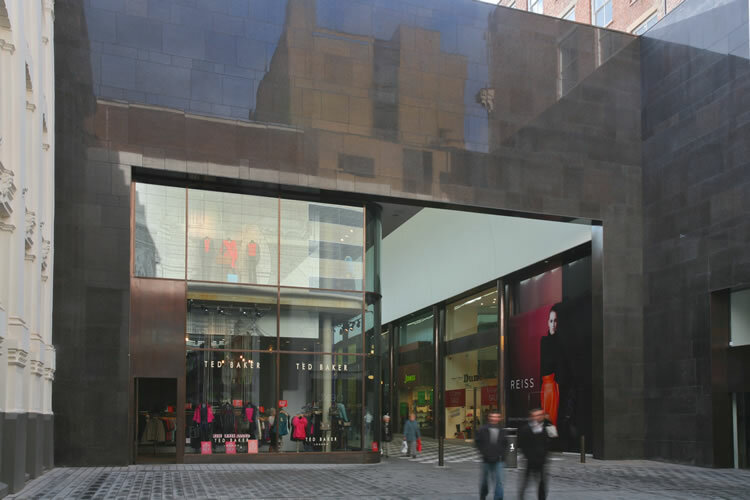 Black and white Chinese granite to form a chequerboard design were chosen for the floor finish in the Arcade and this was textured to a wire brush finish to satisfy slip resistance demands of a ramped thoroughfare. External paving to St Peters Square was 100 mm thick to support vehicle access. The roof garden terrace for the Apartment Block incorporated into the design of the project raised the issue of adequate drainage of rainwater. This was met by incorporating a geo-textile membrane into the bedding system of the Brazilian green riven slate and leaving joints ungrouted.